020060101 Filed under curating, events, work. Bookmark the permalink. This was an event I put together for the Dutch Filmmuseum in 2004, consisting of 11 commisioned installations, six lectures and 14 film programmes about the fascination of artists for scientific concepts. Listings will follow. The ‘Crystals and Curves – Scientific and Avant-Garde Films 1923-1996′ programme was originally put together by Joost Rekveld as part of a much larger manifestation which took place last year at the Dutch Filmmuseum in Amsterdam. 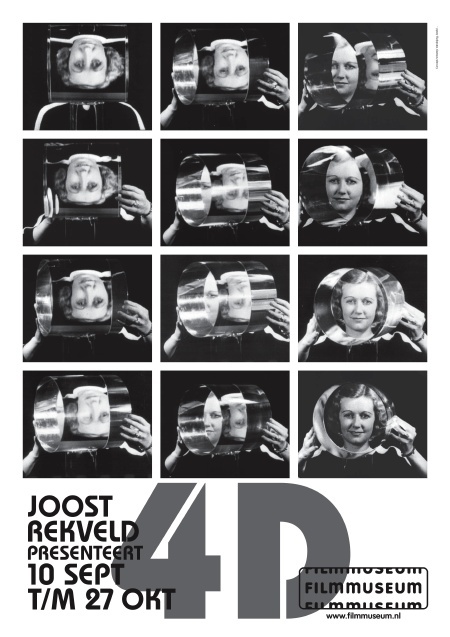 This programme was called ’4D in the Filmmuseum’ and it focused on the fascination of artists with images and concepts from science and technology. It featured experimental, industrial and scientific films, as well as an exhibition of ten installations commissioned for the occasion, a series of lectures and artists’ presentations. At the time in which film was still the newest medium, many artists were dreaming about ways to use film to relate to the new scientific ideas and technologies of the time and to realize some of their potential for social change. Although many of the art forms and utopias of that time are now possibly a thing of the past, the idea of the artist as a kind of researcher and ‘spiritual antenna’ for new developments is still very much relevant. In fact, it can be argued that in the last 80 years, science and technology have developed to the point where the human mind can not imagine or visualize most of the scientific concepts behind inventions which are at the same time profoundly transforming our society. Doesn’t this gap between the reality of science and the reality of our imagination call for artists willing to bridge it ? A bit less than a century ago there was much ado about the fourth dimension. Mystics and mathematicians were speculating about an extra dimension of space, at right angles to the three dimensions height, breadth and depth already familiar to us from daily life. By way of the fourth dimension spiritists were promising access to deceased loved ones. The new physics after Einstein considered time as a fourth dimension, suggesting stunning interactions between time and space. This cloud of ideas was a great source of inspiration for the new language of abstract art that came into existence in this period, and was food for the thoughts of artists such as Boccioni, Malevitch and Van Doesburg. They were not necessarily very well informed about the latest scientific developments of their time, but in their own work they found characteristics that seemed to be well covered by the new scientific terminology. These phenomena around the fourth dimension share one common idea: the vision of a radically different point of view from which new connections suddenly come to light. The idea of a new dimension of some kind became a seed around which all kinds of notions of change and renewal could grow, technological as well as artistic and social. An essentially geometrical concept was suddenly endowed with great spiritual and emotional connotations. These thoughts found their most explicit formulation in 1936 in the otherwise rather obscure Manifeste Dimensioniste. This manifesto was written in Paris by the Hungarian poet Károly Sirató, and signed by about twenty artists, amongst them great names such as Moholy-Nagy, Calder, Duchamp, Kandinsky and Arp. The manifesto wanted to encourage the ‘dimensionist’ tendency in the arts, the tendency which pushed literature to leave the line in order to conquer the graphic page, in which painting breaks out of the plane and becomes three-dimensional, and where sculpture leaves the ‘closed and dead’ space of three dimensions in order to conquer the new, four-dimensional and kinetic space. And finally the manifesto announces a new ‘cosmic and truly four-dimensional’ art form: the ‘evaporation of sculpture, a gaseous art without solid matter as material, where the spectator is no longer an outside observer, but where he himself, with the synthesis of all his senses, is both the center and the subject of art’. Bauhaus artist László Moholy-Nagy was one of the signatories of the Manifeste Dimensioniste, and he had already discussed many of the ideas it contained in his earlier writings. In his books and teaching he continuously stressed the role of the artist as a ‘maker of connections’. He enthusiastically embraced the new science, the new technologies and the new media of his time. He dreamt of the new possibilities, admired the new scientific imagery, but at the same time saw the increasing specialisation of scientists and technologists as a big danger to society. The specialist loses sight of the whole man, according to Moholy-Nagy, and for that reason technological development is not accompanied by the necessary emotional development, resulting in exploitation and war. This danger can be averted by the artist, by acting like a kind of ‘spiritual antenna’: making new technologies and concepts emotionally accessible by translating them into new experiences. The development of new perceptions is the first step in translating utopia into action. The new film medium made it possible to have completely new experiences of speed and synchronicity and it made phenomena on nonhuman scales such as the micro- and macroscopical directly accessible to the senses of the audience. The cinema as a kind of psychophysical laboratory situation, in which the spectator is isolated from the outside world and subjected to ‘stimuli’ on the silver screen, was an important influence on visions of sensory fusion. In their search for a truly filmic art, many visual artists saw film as a kind of graphic art in motion, where the dimension of time was added to the already known two dimensions of the canvas or page, greatly enhancing their means of visual expression. Artists were also experimenting with other, more spatial forms of projection in attempt to develop an artform more suitable to the possibilities and demands of a new era. It is this vision of film as a medium to discover and uncover things that are not yet seen which comes closest to the use of film in scientific experiments. It is here that the romantic image of the scientist and the romantic image of the avant-garde artist overlap most: both try to visualize things not yet known, in a way which is the most direct and efficient, without too much regard for the images which already exist.